Doughnuts go with breakfast like pancakes go with syrup. So it stands to reason that doughnut pancakes will make your breakfast brain explode. 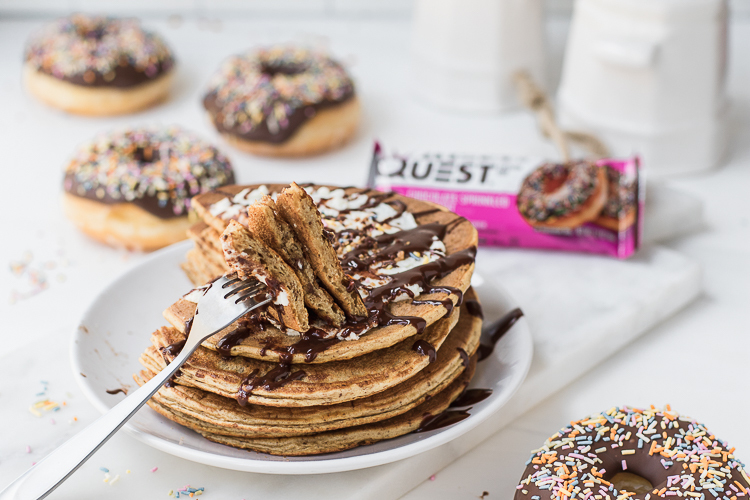 This simple, protein packed recipe will make all the other doughnuts and pancakes jealous with it’s incredible taste, even better macros, and it gives you an excuse to play with sprinkles. It’s a classic win-win-win recipe. In a large mixing bowl, whisk together the eggs, milk and vanilla and set them aside. Break the Chocolate Sprinkled Doughnut bar into small pieces and place them into a food processor or blender. Blend until fine crumbles form. Transfer crumbles to the mixing bowl and add in the remaining ingredients. Heat a skillet or pancake pan and prepare with a non-stick cooking spray. pour 1/4 cup of the mixture per pancake — cook pancakes on low/medium heat. Cook until bubbles begin to form. Flip and cook the other side until golden brown. Melt Chocolate in a microwave bowl, drizzle over pancakes with sprinkles. Written by: Levi Harris on April 2, 2019.